Spring break is coming up and a whole 10 days without classes means a whole ten days to do whatever you want. Realistically, you’ll end up studying half the time anyway, but we at the Clog are here to tell you one thing. You’ve had midterms for probably the past month, and you won’t have much time after break to prepare for finals. You work hard. You probably overloaded on units, extracurriculars or something else. 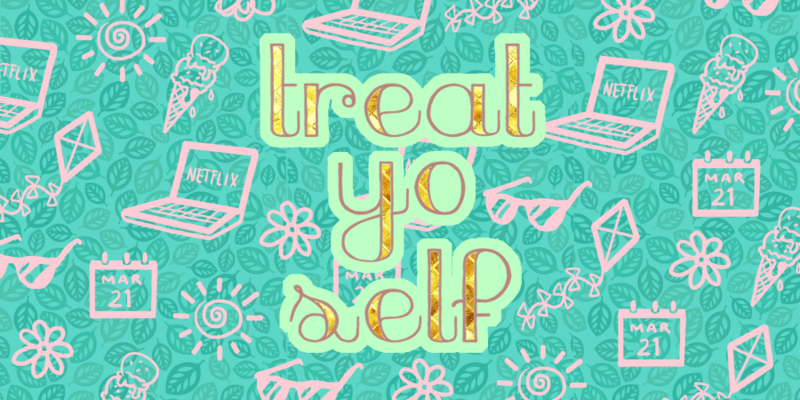 Basically, you deserve to treat yo’self. As a broke college student, you can’t just run out and buy a crystal beetle brooch or a full-blown Batman costume, so we’ve provided a small guide of ways for you to treat yo’self for spring break 2016. Two words for you: bath bomb. Grab some cucumbers, a face mask, a good book and a bath bomb. Then, sit in the bath until the water is too cold for you to justify sitting for any longer. Not only will you feel super content, but all of those backaches and knots you got from hunching over your laptop for months might also feel a little better. This is perhaps the easiest way to relax without being asleep. Speaking of being asleep, what better way to treat yo’self than by catching up on all the sleep you’ve missed? Grab your fluffiest comforter and sleep until Easter Sunday. You probably don’t have anything better to do. Whether you’re going to the sandy stretches of SoCal or taking a stereotypical spring break trip down to Cancún, you can treat yo’self by lying out under the sun and splashing through the waves. OK, Ocean Beach isn’t so great for sunbathing, but you can still play in the water in a sweatshirt. Either way, a couple of carefree days at the beach never hurt anyone. Mimic the great Tom Haverford and Donna Meagle by treating yo’self in the mecca of consumerism: the shopping mall. Forget any limitations your bank account may hold, and take a day to peruse the thousands of stores in Westfield (or a mall of your choice). If you don’t feel like braving the crowds or leaving the couch, arm yourself with an Amazon Prime membership and one-click order your heart out. Take a trip back to the carefree days of not knowing what college was by building a fort with friends in your living room. Watch movies in your blanket fort, order pizza and drink hot cocoa in fuzzy pajamas. Remember: Being a child is all about treating yo’self. Don’t forget to do it even now when you’re an adult. Take your car, or take a friend that has a car, and drive to other parts of the coast. If you’re going home for the week, head somewhere comparable nearby. Make a road trip playlist, put the windows down, get some good food, have some good company and enjoy the ride. Remember, these are just some suggestions for how you can treat yo’self. The most important thing is to enjoy spring break 2016 because we all know you deserve it.